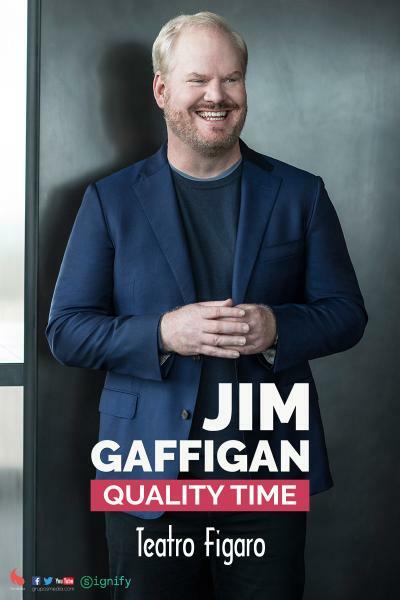 SYNOPSIS Stand-up Comedy Live and Pumpage Network bring the legendary Jim Gaffigan to Madrid on his 2019 Spanish tour! Jim is one of the best comedians in the United States. His comedy has earned him a nomination for the Grammy Awards. It has its own television program and five Netflix specials (at the moment). Tickets for his shows are sold out everywhere and in 2014 he sold out Madison Square Garden, we are very lucky to take him to the stage in Madrid, but it will only be for one night! Jim Gaffigan is a comedian, actor, writer, twice New York Times bestseller and father of five. He is known throughout the world for his unique brand of white humor that revolves largely around fatherhood and his observations about life. Gaffigan, who is one of the biggest box office comedians in the world, is currently on his international tour of the theatrical comedy Quality Time, with dates around the globe. In January 2017, he released his fifth one-hour special, Cinco, on Netflix, which also bought the exclusive rights of the other four Gaffigan specials in an unprecedented deal. The fifth album version, the fifth Gaffigan album, was available on June 13 and during that week, Gaffigan had 6 albums on the list of the 10 best comedy albums on iTunes. Five got impressive reviews, A.V. Club calls Jim: "One of our smartest observational comedians." ¡IMPORTANT! Tickets are not subject to change or refund. Check your order before making the payment.